Prepare the vinaigrette: In a blender jar, combine mint, parsley, garlic, lemon juice, vinegar, and a generous pinch of salt. With the blender running, slowly add in the olive oil. Pour the vinaigrette into a small bowl and season to taste with salt & pepper. Trim the tops from the peppers, place in a bowl and toss with about 1/2 c. of the vinaigrette (make sure the dressing makes it inside the peppers as well as the outside). Stuff the peppers with the feta cheese, place in a 13 x 9-inch baking dish. Cover in plastic wrap and refrigerate for a couple of hours. Preheat oven to 475 degrees f. Bake until the peppers are tender and the skins are slightly blistered. Let the peppers sit for at least 10 minutes before placing them on the salad. In a large bowl, toss the arugula, cucumbers and kalamata olives with some of the mint vinaigrette. 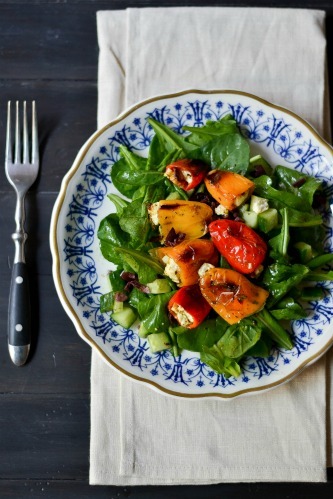 Place a handful of salad on individual serving plates and top with the slightly cooled peppers. 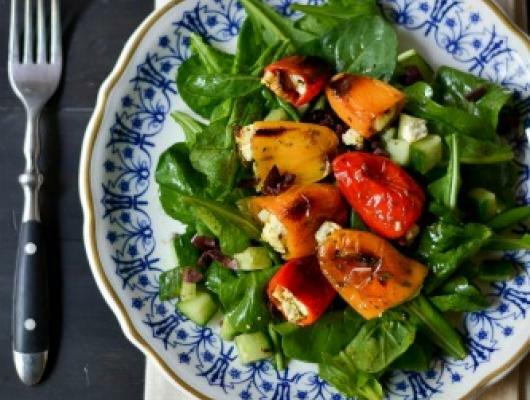 Sweet jewels of roasted mini peppers, stuffed with salty feta, on top of a bed of peppery arugula, tossed with a fresh mint vinaigrette.